Greg Mankiw reviews a paper written trying to support minimum wages. Mr. Mankiw is not in favor of minimum wages and was not sold by the paper. The best paper that I know of on minimum wages was written by Bruce Kaufman. His paper was titled, Institutional Economics and the Minimum Wage: Broadening the Theoretical and Policy Debate. There is something that Paul Krugman is simply not noticing. First, let me quote Mr. Krugman from his recent post, The Depressed Economy is all about Austerity. William Dudley is the President and CEO of the Federal Reserve Bank of New York. He gave a speech about the economic outlook. The speech is standard talk about economic improvement that is not good enough yet. He states that demand is a constraint on the economy. “Turning first to consumer spending, such spending has remained fairly subdued outside of interest rate-sensitive consumer durables. In July, for example, real personal consumption expenditures were flat, and it is unlikely that third quarter consumption growth will be much above a 2 percent annual rate. “Moreover, the drivers of consumer spending do not look particularly supportive. In particular, real disposable income growth has grown at less than a 1 percent annual pace since March. Furthermore, the recent data do not yet clearly indicate a firming in the income growth rate, or the two important components of labor income growth—hours and compensation. “The conundrum for consumers is a simple one: if consumer spending growth is to exceed 2 percent annualized on a sustained basis at a time when real disposable income growth is below 2 percent then this would require the household saving rate to decline persistently. But there is little reason to expect such a decline given that the current saving rate is at a level consistent with current level of household wealth relative to income. Income… Income?… What is income?… In a black and white view, income can be paid to the rich (1%) or to the poor (99%). If increased demand comes from the rich spending more, the resulting income will go to the rich as wages are not increasing. If increased demand comes from the poor spending more, once again the income produced will go to the rich. But we have to ask, if the poor are spending more, where did they get that money? As Mr. Dudley states, disposable income is rising less than 1% currently. Either savings rates go down or consumer debt rises. What does he say about consumer debt? Warning!!! … While incomes are not firming, credit is beginning to ease. This spells trouble. Do we really want the financial sector to rescue demand with credit? But the savings rate is not expected to decline any further. Hmmm…. I guess there should be no wonder why inflation is so slow and stable. Mr. Dudley, just say it… Wages have to rise. The poor (99%) must be the source of the increased demand. What does Mr. Dudley say about inflation? “On the inflation side of the ledger, inflation remains below the Federal Reserve’s 2 percent longer-run objective for the personal consumption expenditure (PCE) deflator. The year-over-year change in the total PCE deflator was 1.4 percent in July. This has created some concern that inflation is “too low,” raising real interest rates and making monetary policy less accommodative. I acknowledge this concern, but I believe it will abate as inflation moves gradually back up towards a 2 percent annualized rate over the next few years. Economics is in a dismal state. I am fortunate to have an answer. I am from the West, but in my worst New York accent, I say, “Ey, Mr. Dudley, I got two words fors ya.” … Effective Demand. Everything he is talking about is explained by Effective Demand, which is lower than previous years and decades due to labor receiving a substantially smaller slice of the national income pie. Low Effective demand explains low savings rates, low inflation, low demand, low income, high unemployment, low wages, mild improvement in the labor market, ineffective monetary policy, and mild but unsatisfactory economic improvement. And to top it all off, Effective demand points to an economic slowdown in real output within the next two years. If we had had a knowledge of effective demand in the past, we would have been able to approximate the timing of every recession since the 1960’s, except for Volcker’s. We would have been able to describe the effects on real output and inflation. And if we were to get some smart economists working in effective demand, we might more clearly see the effects on business investment and more. Look… Here is the bottom line. Effective demand has moved to a new low normal in the past decade. Whether you think the overall economy has or not, effective demand has. According to the track record of effective demand, the potential of the economy will be cut short below the expectations of economists who are looking at past data. How can this happen? The one piece of data that has never substantially changed until now, and which economists are subsequently not prepared to understand… is effective demand. Effective demand is going to make a sneak attack on the economy. One last word from Keynes who never nailed down an equation for effective demand, but had insights into how it would work. Keynes’ insight here is reflected in the equation for effective demand which speaks to wages, output and employment. The question is… How will the Fed get new money to the right class of consumer in order to increase effective demand at the right time to increase output and employment and maintain price stability? Answer: In order to not fall prey to the fallacy of composition, wages must be raised across the board, and if possible, across many countries. Capital has too much money and Labor does not have enough… Full stop. Has hourly self-employment income stayed relatively constant to hourly payroll income? The Brookings Institute has just come out with a new paper seeking to explain the decline in labor’s share of national income. The paper is titled, The Decline of the U.S. Labor Share. It was written by Michael W. L. Elsby, Bart Hobijn, and Ayşegül Şahin. Here is a video of Justin Wolfers explaining the basics of the paper. The Brookings Institute paper says that the decline in labor share is over-stated because self-employed people are earning less in labor income. And the decline in self-employment income explains part of the decline in labor share. They say that one third of the decline in labor share can be accounted for by a decrease in self-employment income. The idea is part of understanding what part of self-employment income is labor income and what part is capital income… but I question their basic assumption. In the paper, they make an assumption. They then say that the hours of self-employed people as a share of total labor hours (self-employment hours + payroll hours) have decreased from 14% in 1948 to 8.5% in 2012. When you multiply hours by hourly wage, you must then conclude that self-employed people are earning less as a share of national income over time. Thus they conclude that the labor share of self-employed people has declined over the years and accounts for one third of the total decline in labor share. It all rests on the assumption that the relative ratio between hourly compensation between self-employed people and those on payroll has not changed over the years. Can that really be a true assumption when productivity from employee work has grown much faster than their hourly compensation? Hasn’t the increased income from increased hourly productivity gone to the “owners” of labor’s work? The self-employed still hire employees who are more productive but not receiving compensation equal to their increased productivity. Aren’t the self-employed reaping increasing benefits from their more productive employees? It would seem to follow that employers, even if they are self-employed, are getting more income from increased productivity of their workers. And if the self-employed are working less hours, wouldn’t it might be because they have more leisure time now from increased pay per hour? Are they earning more per hour and now find they can afford more leisure time off? I think of a cleaning cooperative in Humboldt County, California, called Restif Cleaning Services. The company is 100% employee owned. I talked with them by phone. They tell me that the employee owners receive on average $20 to $24 per hour of work. Now all of their competitors employ workers at a wage rate from $8 to $12 per hour. The self-employed owners at the other companies must be making quite a profit for themselves, especially if we assume those owners are working less hours. I know a lady who cleans houses. She charges $45 per hour. And then pays workers $10 to $12 per hour to do the work. Needless to say, she does not like doing the work herself because she makes much less per hour. If she does a job of 5 hours by herself, she makes $225 at $45 per hour. If she has a worker do 3 of those hours, and she works 2 hours, she makes $200 ($225 – $25), at a rate of $100 per hour of work. In this case, she is making 8x the hourly wage of her employee. She says it is hard to find good dependable employees. And she is a nice religious person who wants to do missionary work in Africa to help poor children. What about employers that are not so nice? Side thought: I think about for a moment how supply-side schools teach that lower wages would shift the LRAS curve to the right. My research into effective demand says that lower labor share would shift the LRAS curve to the left. We can see that the cleaning lady has an incentive to work less hours, but only because she progressively receives more per hour than the employee on payroll. Thus, the more she can get workers to do the work, the more she makes per hour. Thus, we have an explanation of why self-employed people are working comparatively less hours. It is not because they earn the same or relatively the same over time as those on payroll. It is because they are increasingly earning more per hour than those on payroll. This refutes the apparently casual assumption in the Brookings Institute’s paper. One of the keys to saying that self-employed people are earning relatively much more than employed people is based on employee productivity gains over the decades. If I then was to assume that self-employed hourly income had risen against payroll hourly income, I would not have reached the same conclusion as the Brookings Institute paper. I would not have said that a third of the decline in labor share is attributed to a relative decrease in self-employment labor income. It would then follow that a decline in labor’s share of income is more a result of payroll income declining than the Brookings Institute would have us believe. So they recognize a problem with the assumption. I suggest they not be so sure of saying that a third of the decline is due to lower self-employment income. Nick Rowe explores interest rates & aggregate demand… What about profit rates, optimism & effective demand? Keynes says with an exclamation point that a lower rate of interest is the solution to a boom; just keep the boom going by lowering interest rates. Nick Rowe is then asking why a drop in interest rates during 2008 didn’t stop aggregate demand from crashing. The Fed rate did almost reach the zero lower bound by the end of 2008. Back at the beginning of 2004, inflation started to appear. Soon after the Fed started to raise the Fed interest rate. The Fed rate kept rising until the Fed felt inflation was under control around a 2% target. We can see that profit rates took a hit when the Fed rate started to rise back in 2004. But they soon got right back on track. Optimism overcame the Fed rate hike. (more on optimism below) The aggregate profit rate leveled out at the beginning of 2006 and then fell by the end of 2006. Real GDP was growing and eventually hit the effective demand limit in the 3rd quarter of 2007. The recession officially started in December of 2007. Once real GDP hit the effective demand limit, real GDP came to a stop. And we can see in graph #1 that the Fed then started to drop the Fed rate. So the question is… Was the grinding to a halt of real GDP (and by association aggregate demand) due to high interest rates from 2004 to 2008 and then interest rates not going down fast enough in 2008? or Did real GDP grind to halt primarily because of the effective demand limit upon real GDP? In all recessions prior to 2007, except the Volcker induced recession, real GDP slowed down and stopped once reaching the effective demand limit. What does Keynes say about the effective demand limit in Chapter 3 of General Theory? We can see in graph #1 that aggregate profit rates started falling a year before real GDP reached the effective demand limit and kept falling for at least a year after. I would generally say that profit rates had been maximized before and after the effective demand limit. If interest rates had dropped faster and farther in 2008 as the recession was starting, would the profit rate have started heading up? Would the expectation of more profit by entrepreneurs been resuscitated? Or was the true problem having the Fed rate too high in 2006 and 2007? As Keynes said in the first quote above from chapter 22, optimism can overcome a high interest rate. And when real GDP had room to grow in 2005 before hitting the effective demand limit, there was reason for optimism. Profit rates continued to increase. And in a certain light, the Fed rate was inconsequential to the growth of real GDP through 2005. But as profit rates began to maximize in 2006 approaching the “constraining dynamics” of the effective demand limit, the Fed rate became a problem. And when real GDP started grinding to a halt from the effective demand limit, the Fed quickly tried to bring down their interest rate. In light of Keynes’ quote from chapter 22, the Fed rate should have dropped in mid-2006, when profit rates were declining and as real GDP was approaching the effective demand limit. The party of the boom would have been extended by optimism. The demotivating dynamic of the effective demand limit upon optimism would have been overcome. Unemployment and capital utilization would have stayed steady as real GDP kept growing from increasing productive capacity through optimistic investment. Profit rates would have stayed steady, but the sense of optimism to continue enjoying those profit rates would have continued. And the profit rates would not have started downward. If one had wanted to avoid the crisis, one could say that the Fed kept their interest rate too high after 2005. But personally, I am glad the bubble burst. Eventually we will get back to a normal sustainable economy once economists realize that we need to fix where we are, and not try to return to the bubble years before the crisis. We must avoid booms like the last one, and it appears that one is developing again but with labor in a much weaker position. The Fed decided yesterday to keep supporting the “quasi-boom” and the optimism behind it. But the pessimism is still waiting its moment to crash the party… the Fed cannot avoid the eventual pessimism that will develop once real GDP hits the effective demand limit sometime toward the end of 2014. The Fed rate will be somewhat inconsequential once the dynamics of the effective demand limit start to bite. The transmission mechanisms that distribute liquidity to consumer demand labor are broken. More QE just feeds the supply-side of the economy making it more and more top-heavy. There is evidence of a bubble forming from Tim Duy. The Fed is making the economy more and more unstable as time goes by. The imbalance between capital and labor is made more dangerous with QE. Capital needs to be restrained. They have too much power to control production and profits. Whatever liquidity is gained by labor is instantly gobbled up by business like piranhas. As labor’s liquidity has been whittled away over the years through wage stagnation, labor saves less and less. A recession will come within 2 years. Unemployment will not reach 6.5% before that happens. And if the Fed is still providing QE, I have to ask, what is the point of QE? With labor’s liquidity so low and the transmission mechanisms to labor broken, what really is the Fed thinking it will accomplish? And when economists say that tapering may cause a recession, I don’t buy it. My research shows that real GDP must reach the effective demand limit before a recession will happen. 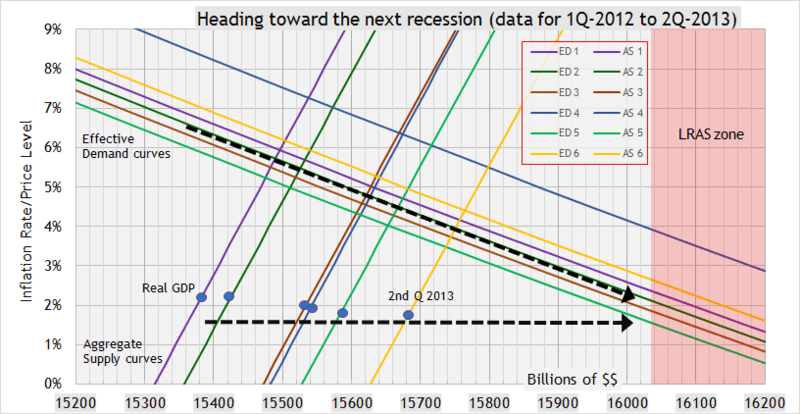 It may slow down a bit, but a recession will not happen with tapering. And slowing-down the economy in order to restrain the dangerous imbalance that is once again growing between capital and labor has more social benefits than social costs. So Fed, please taper, I beg you on behalf of labor whose power is weak and getting weaker as capital gets what they “whine” and dine for more and more. The standard of discipline upon capital has been lowered so far down, that capital has acquired a state of immaturity. People want money for themselves and don’t want to give back to society. Fed, start disciplining capital. Restrain their power and their freedom. Make capital raise their standards of socially productive investment. They are destroying good society. And it is time to bring balance back to our economy which is being overly dominated by capital who has the freedom to move money anywhere in the world. Labor does not have the freedom to move their wares like that. Don’t worry about causing a recession or even a slow-down. The future recession is already established in relation to the effective demand limit. You can’t make one happen now. Please, just taper. Start raising the social standards of monetary policy toward a better society and away from the private interests of those with a greed to wring out labor’s liquidity with a seeming unfeeling cruelty. 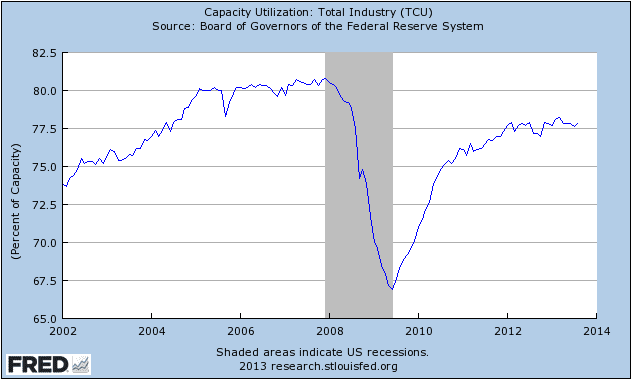 In the previous post, capacity utilization is low and steady, and inflation is too. Low inflation is a sign that labor has a liquidity disadvantage to capital. Explanation below. 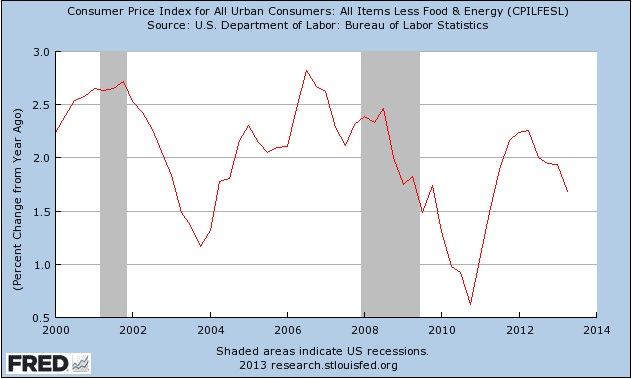 Here is inflation (all items less food and energy on a quarterly basis). Link to graph #1. Quarterly inflation. Is this a problem? Well… One way to look at inflation is to see it as money growth that was not used for increasing real output. In other words, money is being used to increase employment and production. Money then needs to be distributed among more workers and more production. The result is a suppression in price increases. So would we rather have increased employment and production or inflation? Increased employment is better. However, the problem is that money growth is not leading the economy. A little inflation would show that money growth is maximizing increases in employment and production. But when we see inflation falling, employment and production could be better with a little more money around. Where is the money? The real problem is that the money in the hands of labor is not growing. Labor are the primary consumers for finished goods and services. Inflation depends upon money growing faster in the hands of consumers than growth in production. If there is $100 of disposable income, and 10 items to buy, there is $10 available per item. If disposable income rises by 10% and items increase by 5%, there will be $110 of disposable income and 10.5 items to buy. There will be $10.47 available per item. This leads to inflation. But if disposable income rises by 5% and items increase by 10%, there will be $105 in disposable income and 11 items to buy. There will be $9.55 available to spend per item, instead of the original $10. This is disinflation. We have an economy where labor’s liquidity for spending is much weaker than capital’s liquidity for increasing production. Thus, we get this low and steady inflation rate, where production is maximizing its control over the liquidity of consumers. Production is controlled in such a way as to keep the liquidity of consumers from getting stronger. Business methods use such powerful analytical tools that they are able to maximize control over consumer spending to increase their own profits and liquidity. Another problem is that business is also minimizing the cost of labor by keeping wages low. Business, in general, is too focused on increasing profits at the expense of society. The only solution is for labor to increase in power and demand higher wages. Business will simply increase its production and employ more people. That is a good thing, right? Not for business… They are enjoying high profit rates, mostly due to labor share of income falling 5% since the crisis. Link to graph #2. 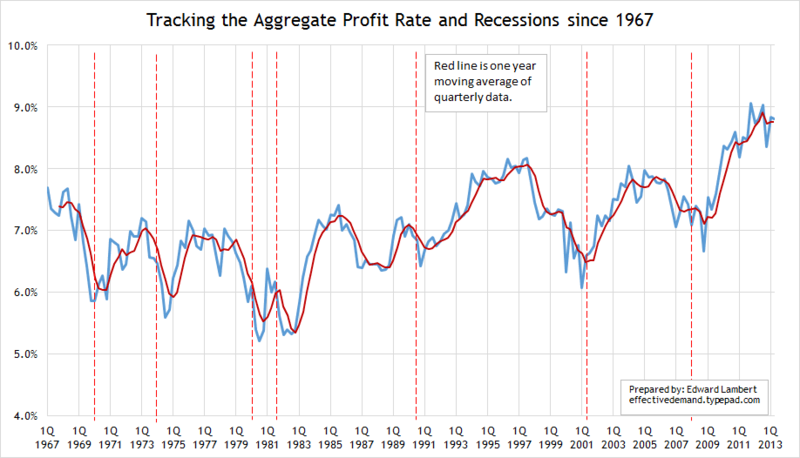 Aggregate Profit rate since 1967. I wrote that Paul Krugman is assuming full-employment. Yesterday Krugman basically pleaded with the Fed to not taper. I see full-employment as constrained by effective demand, which can be determined by quite simple equations. My view comes from Keynes and chapter 3 of his General Theory book. If you assume full-employment as Krugman does, it seems that you are assuming Say’s law. The key is to understand the “vitally important (unwritten) chapter” on effective demand. How is it determined? How does it affect long-run growth? How does it affect employment? How does it affect monetary policy? How does it affect output? How does it affect the aggregate profit rate? Now, Krugman did concede that employment may be closer to full-employment than one might think. He said that if the Fed did not taper, and the economy was closer to full-employment than thought, that inflation would rise modestly. But look at this graph using the AS-ED model (Aggregate Supply-Effective Demand). So as I see it, he would start tapering as real GDP enters the LRAS zone, because that is where inflation will begin showing the white’s of its eyes. But you know, the economy normally goes into a recession within the LRAS zone. How likely is it that the Fed would taper as a recession is forming? The principles of effective demand can be used to evaluate the aggregate profit rate on capital. This measure is a useful indicator of the business cycle. When the aggregate profit rate gets sluggish or falls, the economy is tempting a recession. The growth trend in capital formation was faster before the crisis. 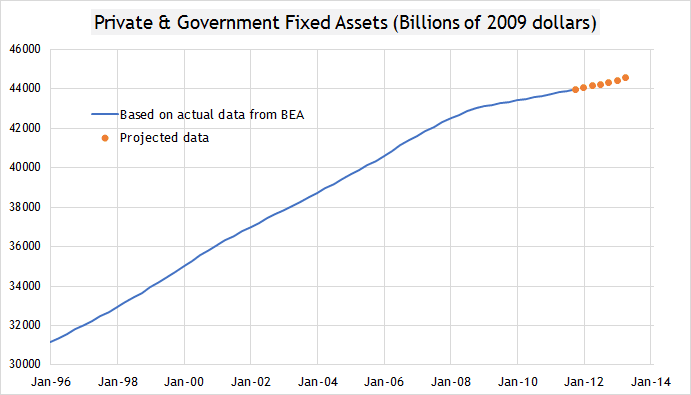 The blue line shows actual data, which the BEA gives up until 2011. The orange dots are projected data for capital that I use to calculate the profits rates up until the 2nd quarter of 2013. 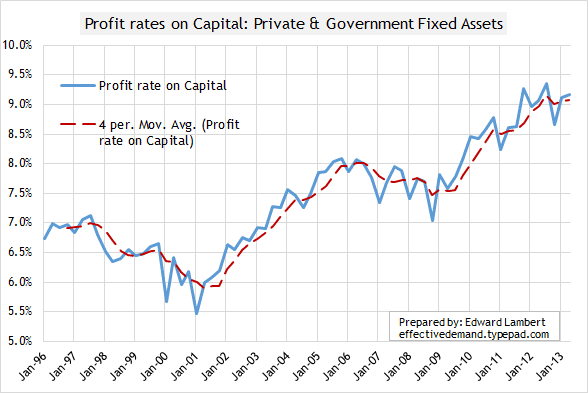 Here then is the graph for profit rates since 1996. In the aggregate, we can see that profit rates peaked in 3rd quarter 1997, which agrees with a graph from Samuel Bowles’ book, Understanding Capitalism. We can see that profits rates dropped until the end of the 2001 recession… and then started rising fast through the bubble years. The dashed red line shows the 1 year moving average for profit rates. We can see that profit rates were stuck for 2 years before the 2008 crisis. One could have seen here that a recession was likely. When profit rates are seen along side the consumption rate of capital income, the picture gets clearer to forecast a recession. I see a pattern where capital income’s consumption rate rises really fast after the profit rate has been rising steadily for a couple of years and then begins to taper off. Behaviorally, I see capital income being spent on consumption as the profit rates are seen as peaking. The profit rates head downward and capital income starts to protect itself by not over-extending its consumption. 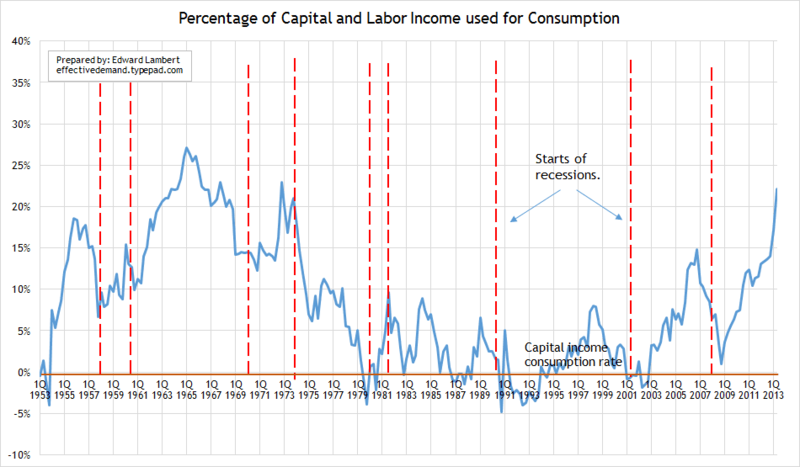 As the profit rate stays “sluggish”, less and less capital income is used for consumption. Keynes saw that profit rates were important to determine the volume of employment, as well as the point of the effective demand limit, which points to the moment of a recession starting. Some economists thought the economy was on the verge of a recession in 2011. There was a brief stalling of profit rates and capital income’s consumption rate. But the economy pulled up from there. The economy will wait until the effective demand limit before going into a recession, with the exception of the Volcker recession. Something to keep our eyes on is that the profit rate tends to flatten out before capital income’s consumption rate starts to fall. And it sees as though profit rates are currently flattening out.